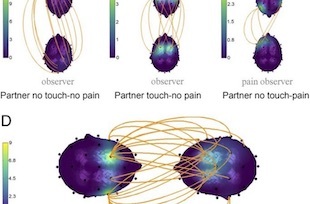 Presence of one’s partner triggers synchronization of certain brain waves. Being in the presence of one’s partner, with or without physical contact, is associated with a synchronization of certain brain waves. This coupling increases when they hold hands and even more if one of them suffers.